There were so many highlights in this game, but too many lowlights including some bad fielding plays, a questionable “send”, a non-hustle play on a groundout by Juan Soto, and some bad situational hitting. The star of the game was Kurt Suzuki who crushed a two-run home run, and Brian Dozier hit a 9th inning blast to centerfield to get off the schneid. Anibal Sanchez pitched well enough to win this one giving up 3-runs in 5 2/3 innings. The bullpen was good in spots until Justin Miller gave up a home run in the 8th inning which is the team’s 18th run they have given up in the 8th inning. 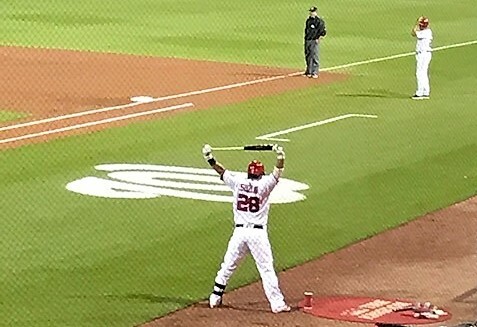 In the 9th inning, Brian Dozier led-off the inning with a home run to put the Nats one run behind, and Anthony Rendon hit a line drive double. What looked like a promising 9th inning then went cold as the Nats were in a great spot. Juan Soto should have walked but he was put an errant call by the homeplate umpire put him in a 2-strike count where he had to shorten his swing and cost him as he hit a liner to deep leftfield which the Phillies caught up to as they were playing deep. Ryan Zimmerman hit a weak grounder after missing two meatballs, and the game ended on a Kurt Suzuki flyout. The Phillies did not play well, but they didn’t make as many mistakes as the Nats. The first two Phillies runs of the game came on a Odubel Herrera two-run home run, but the at-bat before Herrera was a ball hit right to Wilmer Difo‘s backhand and he did not shuffle in front of the ball on a grounder ruled a single. That runner on base scored on Herrera’s two run shot. Add two solo home runs from Rhys Hoskins and you have all of the scoring for the Phillies. The most controversial play of the game was when Kurt Suzuki in a 3-2 count and Zimmerman running on the pitch lined a ball into the right-center gap with 2 outs. Third base coach Bob Henley sent Zim home, and he was out by 10 feet. He never even reached the base. If Henley holds Zim at 3rd base, you would expect Phillies manager Gabe Kapler to intentionally walk the on-deck batter Wilmer Difo and pitch to Anibal Sanchez who is a career .078 hitter. You have a 1-in-13 chance of Sanchez getting a hit there but maybe Phillies starter Vince Velasquez uncorks a wild pitch or hits Sanchez or walks him with bases loaded. It’s baseball — so you never know. Worst case you turnover the lineup. Oh well. That is how this game went. This entry was posted in Recap, Uncategorized. Bookmark the permalink.